This is a really easy one-pot recipe where all the ingredients are roasted together. It is ideal for a family supper - you could even serve it at the table, straight from the roasting tin. Preheat the oven to 200°C, gas mark 6. Place the potatoes in the roasting tin and tuck the lemon pieces in between. Place the rosemary sprigs between the potatoes, then season. Sprinkle with the chillies and pour the wine over the top. 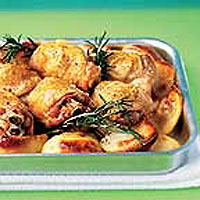 Arrange the chicken thighs, skin-side up, on top of the potatoes. Cook for 45 minutes or until the potatoes are tender and the chicken is thoroughly cooked, there is no pink meat and the juices run clear when the chicken is pierced. Serve hot. For an exotic twist, use sweet potatoes in place of the Maris Piper's and add a star anise or two.